What is amigurumi and how do you pronounce it? Pronounced ahma-goo-roomie, amigurumi is a rough Japanese translation of “knitted or crocheted stuffed toy”. :) Often referred to as “amis” they are cute little critters or objects crocheted in the round. How did you get into crocheting? When I first joined etsy back in November 2007 I was selling felt plush and hadn’t even heard of amigurumi. It didn’t take long to start seeing these unbelieveably cute little critters on the site and I so wanted to make my own. But there was one problem…. I couldn’t crochet…. but I suddenly had a strong motivation to learn. Unfortunately for me I didn’t know anyone who crocheted and the thought of teaching myself was a daunting one. This was mainly because previous attempts at learning how to knit from my mum years ago had failed. I can’t knit! But I had to learn as I so wanted to make amigurumis. I searched on Amazon looking for a beginner’s book to crochet and also an amigurumi book so I could learn the basic stitches and shapes required and then went on from there. I also found watching crochet videos on youtube a great help as I learn easier from being shown, rather than trying to follow diagrams in books. There’s so much help out there on the web which I’m greatly thankful for. How long have you been crocheting for? I love reading back at an old blog post I made towards the start of March 2008 when I was first trying to learn. It makes me smile and pleased I carried on with my challenge back then and what I have since achieved. What was the first thing you crocheted? 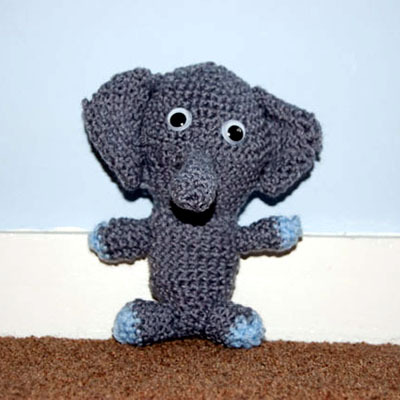 Apart from disregarded patches of crochet when I was trying to learn stitches the very first thing I ever crocheted was an amigurumi elephant. :) The pattern was from a book called Super Crochet Wonderful by Narumi Ogawa. It was the very first pattern in the book so I thought it had to be the easiest, surely? Looking back now I’m not so sure but I stuck to it right to the end and this is it…..
How long does it take you to make an amigurumi? It can take several hours for me to make just one amigurumi. I don’t claim to be the fastest at crochet although I don’t think I’m slow either. But it can really depend how much detail there is on there to complete, as well as how many limbs/objects there are to make and stitch together, it all adds up timewise. Do you give away or sell your patterns? When I first started designing and making my own amigurumis it never occured to me to distribute the patterns for others to pick up and use. I’ve been asked a few times now for my patterns and I guess I still don’t have any plans to release them. How can I purchase one of your amigurumis? Do you make custom order amigurumis? Yes, I have taken on many custom orders in the past. Please contact me for more information. Can you help teach me how to crochet? Not really but give it a go as there’s a whole crochet world out there waiting for you. :) Have a search on amazon or google and look for beginner’s books/guides to crochet and also amigurumi tutorials to learn the basic stitches and shapes required and then it’s down to your imagination. Try watching crochet videos on youtube. There’s so much help out there on the web, just have a good look around.